More and more clients are requesting ICND to add Social Media features to their websites. Socially interactive websites are the wave of the future and it is upon us. Facebook alone has over 750,000 active users today and 2.5 million websites use it as a marketing strategy. Social Media has clearly made its mark as an indispensable tool to reach out to clients. It’s no longer just a site that connects friends, family and colleagues. Facebook alone has grown and evolved as one of the vital marketing tool for businesses as well as a new avenue for companies interested in communicating with current and prospective customers. There are hundreds of social media plug-ins, a few of which are designed to display Twitter feeds, pull in your Delicious tags or even import Facebook comments all right on your website. Plug-ins allow visitors to spread the word about your website — the specials and deals you have, or new property listings. It’s an excellent way to reach a larger market than your website alone can possibly reach. 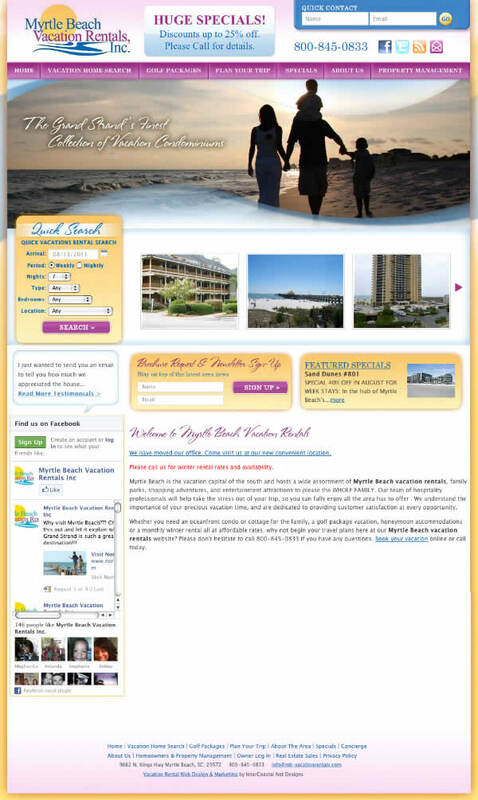 Following is an example of the new socially interactive direction we are taking Myrtle Beach Vacation Rentals in. You’ll see in the lower left quarter of their homepage, the Facebook social media plug we have integrated into their site. Like Button ~ This button lets users share pages from your site back to their Facebook profile with one click. Send Button ~ This button allows your users to easily send your web page content to their friends. Comments ~ The comments plugin lets users comment on any piece of content on your site. Activity Feed ~ This plugin shows users what their friends are doing on your site through likes and comments. Recommendations ~ The Recommendations plugin gives users personalized suggestions for pages on your site they might like. Like Box ~ The Like Box enables users to “like” your page and view its stream directly from your website. Login Button ~ This button shows profile pictures of the user’s friends who have already signed up for your site in addition to a login button. Registration ~ The registration plugin allows users to easily sign up for your website with their Facebook account. Facepile ~ The Facepile plugin displays the Facebook profile pictures of users who have “liked” your page or have signed up for your site. Live Stream ~ This plugin lets your users share activity and comments in real-time as they interact during a live event. If you have not started your Social Media campaign, today is the best time to begin. We urge you to get in touch with our ICND professionals. Allow us to sit down with you and show you how Social Media can help your business grow. Every day more and more people are creating social media profiles and Facebook is gearing up its efforts to segment profiles in a way that will easily target your business niche.